Fall is here and at Showhome furniture we are filling our shelves and store space with amazingly fabulous fall finds!!! Along with all our fall finds you are sure to find a pumpkin here and there because let’s be honest, pumpkins are delightful the way that they come in all sizes and shapes-just like all the unique things you can find in our store. There is something so magical about a pumpkin shape no matter how warty it is. Today I am going to show you a few quick DIY pumpkin craft. First, find your pumpkins! The wartier the better! I found mine at the local dollar store, craft store and thrift store! Next get a few supplies from the dollar store. Some jewel stickers, some white glue, the glitter of your choice, some paint, and brushes. A super simple pumpkin is just to repaint a pumpkin any color you want. I tried blue for some of my warty ones and really loved it. To make it more realistic, paint the whole pumpkin and before it dries rub off all the paint except the paint in the cracks. This really brings out the pumpkins character and can turn a fake cheap looking pumpkin into a classy gorge worthy to grace your home! Another super simple way to dress up your pumpkin is to use gemstone stickers. You can use these on orange or white pumpkins. Black adds a bit of drama to your pumpkin that goes well with all themes. You can also paint your pumpkin and then cover it in gemstones!!! Glitter is a great way to bring sparkle into your fall decor. There are a ton of ways to use glitter. You can use a stencil, you can dip the lower half of a pumpkin in glue and then pour glitter over the glue and let dry. 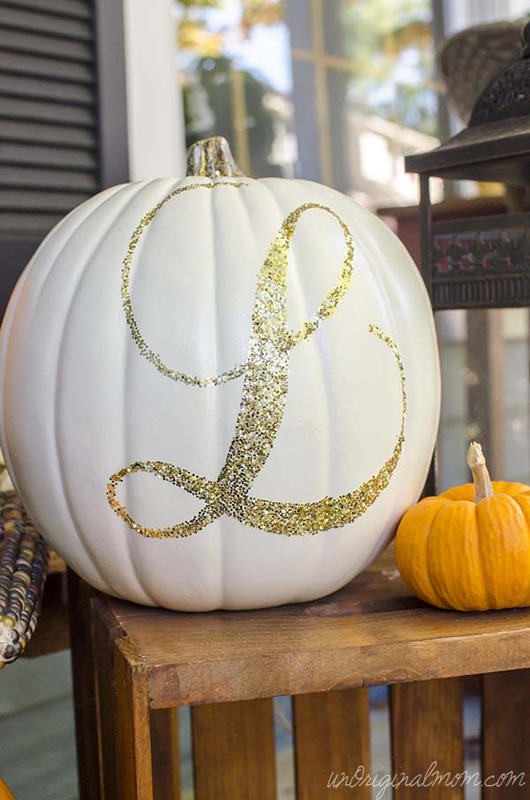 Or you can polka -dot your pumpkin with glitter to bring in some whimsy to your project. These are beautiful! Great affordable seasonal decor idea. Thanks for sharing! I love all the different was to decorate with pumpkins. A style to fit any decor. Those polka dot pumpkins are my favorite, I’ll definitely be trying that one year! Love the gold and white! Need to try it!! Great ideas. This looks way easier and more beautiful than carving pumpkins. I wonder if I can talk my kids into this! The glitter polka dots are everything!!!!! Now I want to paint a pumpkin! Thanks for sharing these really neat ideas! As a mother of 4, I really admire the show home family, for having 7 children and doing all that they do, it’s amazing. Not only that but the size of their hearts really shines through!! So many great ideas to try – simple, adds colour, conversation and glamour to ones home.